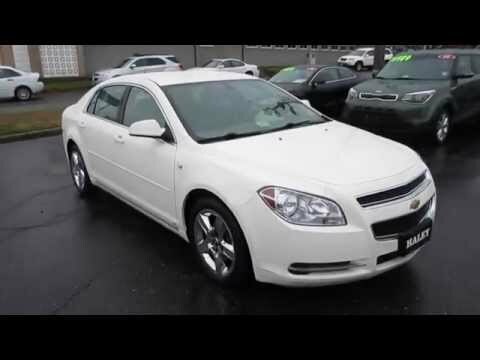 The Malibu's bold, attractive sheetmetal and stylish interior touches are backed by confident handling, a quiet ride and an overall level of refinement competitive with the category's best. Still under 100, 000 for it to be an 08. Deep grey color with sunroof. When we first got the 08 Chevy Malibu we loved it, it is somewhat okay on gas. For it to be a plain car on the outside the inside has special features like a sun roof. The color of the car is a deep gray, does have Chevy rims. The tires have healed up while only on was replaced due to it begin damaged in a hit-in-run. I do wish the windows would have been tinted before hand definitely would of been a plus during the summer. But the vehicle itself has many problems since we got it. The first was the ac, then we have had to buy two batteries for it, a new radiator and fan since the fan broke to pieces. We paid over 200 to have the headlight fixed because the wiring was damaged but still the light does not work. The car has been hit from behind at a red light and also hit in Walmart parking lot. For it to be a sedan type vehicle is really not roomie on the inside. There’s three people in my house hold and we hardly ever go anywhere in due to how small. The seats are not very comfortable. I do love that it has heated seat for winter. Wish it would have more ac vents in the back seat since I have a child. With all the repairs done to car it really is not worth money anymore. It is still under 100, 000 and just seems to always have problems. The insurance on it is fairly good. My vehicle was an great pick for me personally because I like small cars. My car drives pretty good. Only thing is I have a great mechanic but certain things he cannot fix because my care is required to go to an dealership because it's more of an electric car than anything. Including sensors that only the dealerships can fix like my power steering is an sensor and my mechanic couldn't do it because it is a certain tool the dealers use. On top of that I went to live stop for an oil change I asked if they can check the fluids to my transmission and they couldn't do it because they stated it has to go dealership because it do not have the dip stick and they are the only ones who would have it and the only ones who can tell me the level and the only ones who can refill it to the correct level so before buying a car I need to look more into them to make sure I can afford the prices of parts and labor. Great family car, reasonably priced, few maintenance problems. The Chevy Malibu is a great family car. It easily accommodates 5 people. It is a nice size not too big or small. The mileage is middle of the road, not especially thirty but not overly expensive. I have had relatively few problems over the 11 years that I have owned this car. Previously I had a Buick Lesabre, which was also a great car which actually lasted 15 years. I passed it on to my grandchildren, which is what I intend to do with the Malibu. I am planning to purchase a new car in the next year and this car will be passed on to a family member, who will probably have it for about another 5 years or pass it off to someone else. I am been very pleased with this car and am planning to buy another Chevrolet Malibu.